You can listen to 'Ingenue' here. Amok is a word used in Dutch and means as much a stirring a commotion, a watered down version of the Malayan/Indonesian word "Amuk" running around all of a sudden with a kris in hand and kill someone in a quite bloody way. 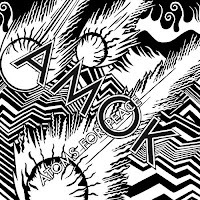 Amok is also the title of a band called Atoms for Peace, with no less than Thom Yorke as singer/leader. We also hear Flea of Red Hot Chili Peppers fame, producer Nigel Godrich, Joey Waronker and Brazilian percussionist Mauro Refosco. Reading the reviews I concluded beforehand that this is no album for me. So what happened? Somewhere in 2000 a friend asked me on 'Kid A': "Wo., what do you make of this"?, implying 'Wo., this is no music!' I told him that I was still dealing with the album, but never listened to it again to the best of my knowledge. Although I got to terms with Radiohead again, enjoying most of its albums since the famed 'Kid A', the weirdest album to enter a chart at the no. 1 position ever, I guess. Amok was compared to 'Kid A' hence my long introduction. Yes, there are clear comparisons, but I guess time has opened my ears to this extreme form of electronic rock/pop music and Amok has elements that are a lot more poppier. Atoms for Peace came up with a very rhythmic album, that comes close to what Yorke makes with his mainstay band. Overall Amok is more mellow and less confronting. The sound is less filled, flatter, aimed more at effect than confrontation. It also makes Amok more one dimensional than any Radiohead album. If anything I'm surprised that Flea is the bass player of Atoms for Peace. He is so uncharacteristically not present, playing soft and smooth in the background that I'm suspecting that in reality it is Fernando Saunders playing. The rhythm is constantly in less usual time signatures, complex, shifting, analogue and digital. With sparse keyboards and guitars over the rhythm. Thom Yorke sings with his usual soft voice over the inorganic sounding music. Like music from the future or another planet, but nowhere near to what the makers of 'Star Trek' expected music to be in some stardate or another. It makes no sense to name a song here. Amok is an album one has to undergo in its entirety. Drifting with the subtle (mood) changes, while listening intently. In the background this album will just disappear or annoy like the buzz of a fly or mosquito. Give it a chance and the beauty of Amok will reveal itself to you. 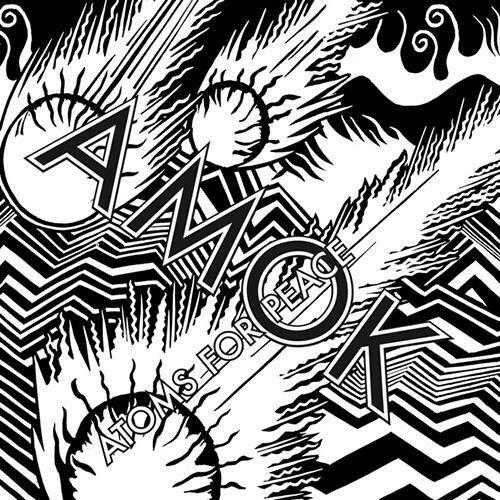 Amok can compete with what Thom Yorke creates with Radiohead, easily.